With great love and respect in our hearts, we are calling upon Cosmic Sai Baba to make his presence amongst us. 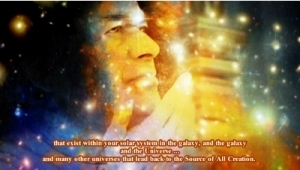 ❝It is I, Cosmic Sai Baba, and I am very pleased to be here. I have waited some time, but that is alright – it is good to share knowledge and to speak about things for this helps to create more thinking, more questions and more knowledge comes out – particularly when it is shared amongst friends. This Earth is still in disarray … and I have promised that it will start to settle and become balanced. It will take some time of course, but you will see this very soon – and I know you question the word ‘very soon’ because we have often used it from other worlds and our time measurements to your earth time measurements is very different. I am aware of that … but trust me! Do not give up! … Everything is changing and it is changing so fast it needs time to settle and integrate – and I mean everything. Everything that you think about or worry about is changing. And so have faith – because the changes are coming. Slowly but surely. And probably the slowest would be within the human mind itself. I have said before, your brain is like a computer and so there are many things in your brain that will be ‘popping up’ for you to look at. A ‘thought’ that comes forth and it is a little like an opportunity to press a ‘delete’ button and not enter into thinking about it – or trying to consider what it is all about – but rather if it is a negative energy, a negative thought, then just DELETE it and move on. Am I explaining myself? I hope so, because it is that simple. It is like re-programming your brain. And in doing so – of course you are connecting to the Soul Consciousness that exists in your body – but it is in another world. For it is your Soul (as I have said before) that holds the energy that is LIFE in your physical body – which has become your SPIRIT. So I am speaking now, of asking you all, to just progress … … and not hang onto anything that is unnecessary. Does this make some sense? It is an opportunity to ‘wipe the blackboard clean’ … of all the past, all the history that is in your Soul, even. You need to release that. And let it go. Because it is influencing you through the cells of your body. It has grown into knowledge within your body which affects you. … And so if you can let every little negative thought that comes into your brain … which will seem like a thought … if you would let it go … you will heal … you will heal quickly. This is what I am saying: There is an opportunity now to close the door behind you and move forward into a new world more completely. It is yours – it one that you have created. It is one you CAN CREATE – so it is up to you as to what you DO CREATE. And I ask you to think – and consider – very carefully – what you are thinking. Because that then becomes your CREATED WORLD. So with that I will leave you to think about it. I have not come to lecture … I have come to offer you my Universal Love – which is ALWAYS AVAILABLE. All you have to do is to call upon me, and I will be there. Thank you my dear children, but for the moment, before I leave, I want to Bless All those that have written to me and I want to reassure them that I send my Love and my Caring and know that I am with you always. I thank you for writing to me – and my thoughts are with you. I bless you; I bless you my children, I bless you.